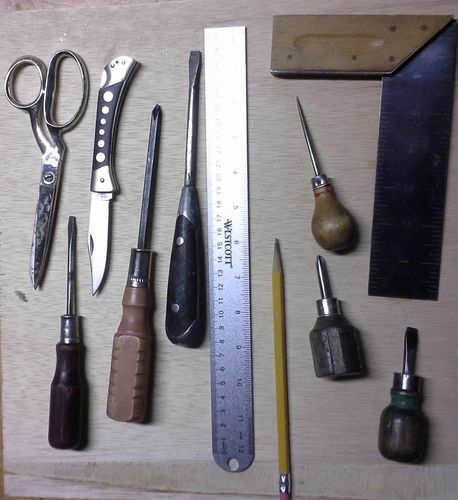 Before heading to the wood storage area to do some cleanup and organization, I made a quick stop at the workbench. What are the tools that I always reach for first and most often when working on any given project? 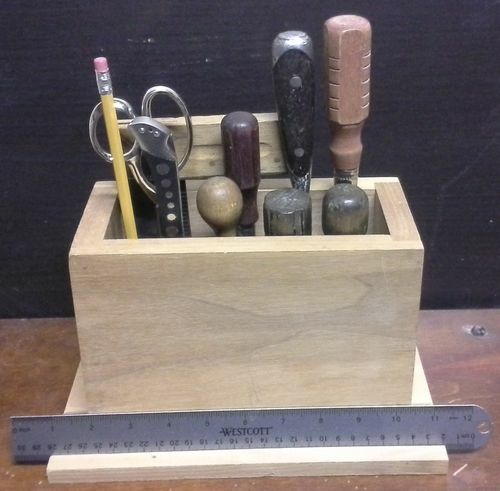 To hold this small assortment of tools, I turned to an old maple box that I’ve had banging around the shop since time began. I’ve never found a good use for this until now. It’s just the perfect size for the project at hand. 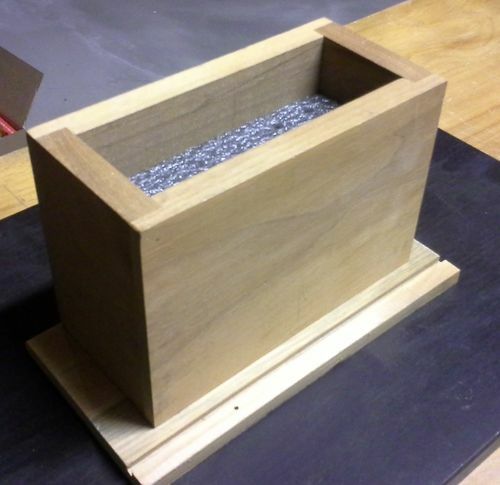 The wood scrap box yielded up a piece of half-inch thick pine that was part of a drawer in its previous life. 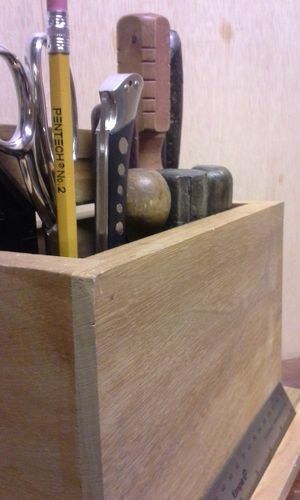 It will serve fine as the base for the tool holder, complete with a ready-made groove to hold the ruler. Some glue and a few screws later, I had a nifty little bench-top storage unit. For now, the tools are stuck into a piece of hard foam which was carved to fit inside the box. so I will be soon fabricating a wood top for the holder that features proper holes laid out to custom fit the small tool collection. I might even slap on a finish of some sort to the whole affair, just to make it purty. For now it does the job in its present form…. Ed – good post. I have also found it helpful to review which tools are most often used and make them easy to access. Another consideration is have a place for everything and every thing in its place. That why adding a top to the box is useful IMHO. Both are a big help as we mature and seem to forget why we walked upstairs :) My shop has lots of storage and it really helps with labels on the drawers with the general name of what is in them. Thing is, my planes ae the things I reach for first and often. It would take a really big box for them! socrbent – Thanks. I’m glad I’m not the only one who has gotten up for a given errand or mission, got to the next room, and immediately forgot what I got up for. Do it at wotk lots. Sigh…. BustedClock (would be interested to know the story behind that handle) – sounds like a good plane till is in order. Indeed… I’m committed to this project now. In too deep to turn back. I do have a couple of real honest to goodness wood projects on the docket, too.